Universe Gates - They know how to make an entrance! Quite literally as it turns out, for it is in the business of front gates that they operate. Designing, installing and maintaining to the highest professional standards, should you be left in any doubt as to their workmanship. 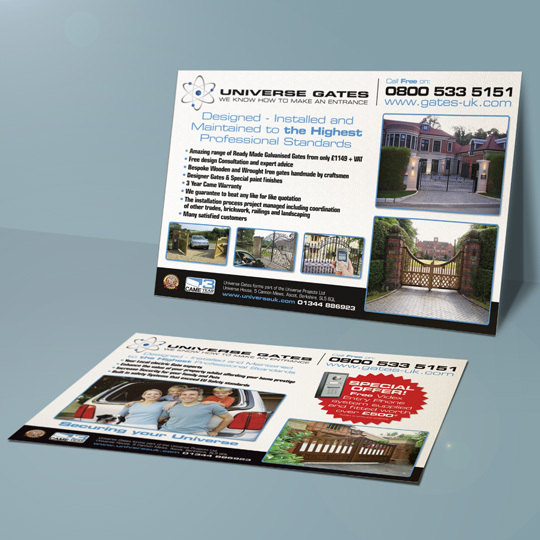 They kindly supplied us with plenty of stunning gate images from their satisfied customers, which we liberally adorned over both sides of these stately A5 leaflets. Presumably, the type of person looking to erect a fortification of this nature is going to be sitting pretty on a nice piece of real estate and the lush modern trappings contained therein. 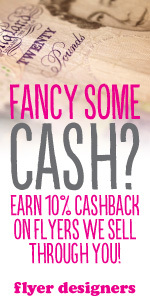 It will no doubt delight interested parties then, in finding out they have a special offer on for a free Videx entry phone system, supplied and fitted with any new gates ordered. Perfect for keeping troublesome door-to-door salesmen and Jehovah's Witnesses at bay.